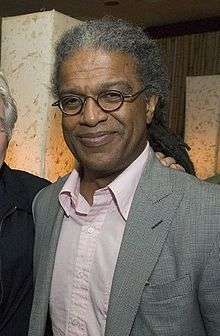 Elvis Mitchell (born December 6, 1958) is an American film critic, host of the public radio show The Treatment, and visiting lecturer at Harvard University. He has served as a film critic for the Fort Worth Star-Telegram, the LA Weekly, The Detroit Free Press, and The New York Times. In the summer of 2011, he was appointed as curator of LACMA's new film series, Film Independent at LACMA. He is also currently a Film Scholar and lecturer at the University of Nevada, Las Vegas. Mitchell was born in Highland Park, Michigan, in the Metro Detroit area. He graduated in 1980 from Wayne State University, where he majored in English. He was a film critic for the Fort Worth Star-Telegram, the LA Weekly, The Detroit Free Press, and The New York Times. In the 1990s, Mitchell was part of a short-lived PBS show called Edge. On the series, he provided film commentary and general criticism. In one segment, Mitchell offered a quick run-down of all of director Oliver Stone's tropes, including "always keep that camera moving," which he said while moving a camcorder over a model of a Viet Nam jungle and prison camp set up on a table. Mitchell produced The Black List in 2008, with director Timothy Greenfield-Sanders, a documentary film about race, culture and the seeds of success. The film includes Toni Morrison, Chris Rock and Kareem Abdul-Jabbar among others. A follow-up film, The Black List Part 2, was filmed in the same style with director Timothy Greenfield-Sanders. The second film features Angela Davis, Tyler Perry and RZA. Since 1996, Mitchell has been the host of Santa Monica, California, public radio station KCRW's pop culture and film interview program The Treatment, which is nationally distributed and podcast. He served for a number of years as a pop culture commentator for Weekend Edition on NPR. In 2008, Elvis Mitchell: Under the Influence began airing on Turner Classic Movies. On the program, Mitchell interviews actors and directors about their favorite classic films. Mitchell is featured in the 2009 documentary film For the Love of Movies: The Story of American Film Criticism discussing how he was championed as a young writer by Pauline Kael, and the impact on him as an adolescent of the Herschell Gordon Lewis film, Two Thousand Maniacs!. On September 10, 2010, film critic Roger Ebert announced that he would be returning to television on a movie review show that he was producing for public television. He also announced that Mitchell, along with film critic Christy Lemire of The Associated Press, would be featured on the new program reviewing the new films released. On December 14, 2010, the Chicago Sun-Times reported that Mitchell would not be appearing on the new show. In January 2011 it was announced that Mitchell had joined the Movieline as chief film critic, along with Stephanie Zacharek. Penske Media Corp terminated him after more than three months as Movieline.com's chief film critic. Mitchell has been hired by the LACMA in partnership with Film Independent as curator of a new film series, Film Independent at LACMA. It was announced on June 16, 2011 that Mitchell would start his new job on the weekly film series this July. The series launched on October 13, 2011 with the world premiere of The Rum Diary, an adaptation of Hunter S. Thompson's novel, by director Bruce Robinson, starring Johnny Depp. In 2007, Mitchell appeared in an episode of the HBO TV series Entourage, playing himself. In 2014, Mitchell was mentioned as "the bad boy of public radio" during the FOX TV series Bob's Burgers episode "Friends With Burger-Fits." ↑ "Conversation with Elvis Mitchell". Oxford.bside.com. 2010. ↑ Susan King (September 29, 1991). "ROBERT KRULWICH: Pushing PBS to the 'Edge'". The Los Angeles Times. ↑ Rousseau, Caryn (September 10, 2010). "Roger Ebert to appear on movie review show". Yahoo! News. The Associated Press. Retrieved September 11, 2010. ↑ "Critical decision near for Eberts' movie show". Chicago Sun-Times. September 10, 2011. ↑ "Welcome Movieline's New Contributors, Including Critic Elvis Mitchell!". Movieline. January 12, 2011. Retrieved March 18, 2011. ↑ Finke, Nikki (April 23, 2011). "Elvis Mitchell Terminated As Chief Movie Critic Of Movieline Over Review Mystery". Deadline.com.